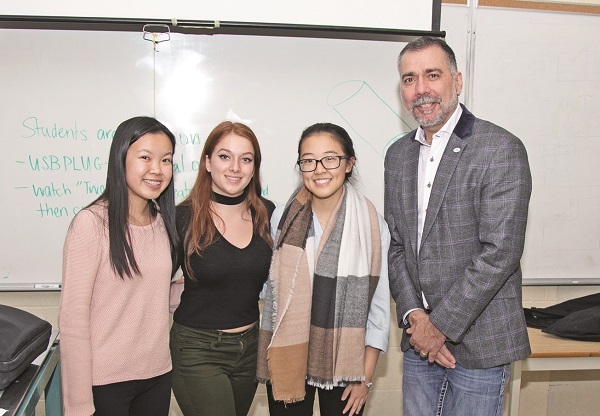 Aurora High School students are preparing to “boldly go” into 2019 with some creative new ideas. Now that school has resumed, over 80 Aurora High School (AHS) students will get down to business, joining the ranks of St. Maximilian Kolbe Catholic High School with their inaugural robotics club. The fledgling Aurobots recently received encouragement from Mayor Tom Mrakas as they prepared their build season, which will continue over six weeks. At this point, the Robotics Team has little idea of what will be in store for them when they set out for competitions in the FIRST Robotics League; all they know is the theme is “Deep Space” and, in this case, the sky isn’t necessarily the limit. Founding students began laying the groundwork for the club as soon as the school year began in September. After putting up posters all around AHS, there was an immediate response and excitement, says Amanda. The club offers something for everyone regardless of interest. “There is a goal for everyone in this team: there is the programming and engineering component, which is building the robot, but even for people who aren’t interested in engineering at all, and who don’t like sciences and math, we still have our business side and our design side, which are both really important and really great roles to be in for our team. The team has also received generous community support in its first few months, receiving sponsorships from Magna and Almac. To learn more about the Aurobots, see what they’re working on, or provide sponsorship opportunities, follow them on Instagram @frc7456 or email frc7456@gmail.com.